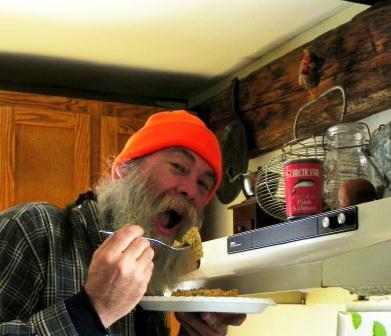 Our 100th Post: Six and a Half Foot Man Eating Salmon! It is gratifying to see how far The View from Fish in a Barrel Pond has come since Post #1. Congrats! …now, I’m going to go read post 1. There’s NO WAY that man is six and a half feet. Sorry, just callin it like I see it. An’ I’m callin’ you, sir, a no good, exajeerating, blow hard LIAR. Looks like cat food, to boot. 100 posts is nothing…in North Dakota we’d do that in an afternoon with a shovel and not work up a sweat. If u spent less time fishin and more time put up the fence….oh well it is what it is…..
Mmmmmmmmm… Salmon. Congrats on your hundredth, my friend. It’s so nice to feel the love. To be called a liar, a slacker and frightening to boot! Owl – Shocking, ain’t it? rob – If only more people would listen to you! ‘Stan – a real fisherman would say ‘close enough’ and let it go at that. That guy is tall enough to watch what’s been going on atop your pate these last 20+ years (less and less all the time). Thank you for the pleasure you have given me. I do enjoy all of these posts. Nancy, you are are one of my longest suffering I mean most dedicated readers! Thank YOU. Dang…I always tell people that you’re 6′ 7″. You, sir, just made me a liar. Way to go, cuz.